A lightweight GFRC mix made it possible to cast a large 34-square-foot concrete island that could be carried up a flight of stairs Project submitted by David Eerdmans, Hard Topix Precast Concrete, Jenison, Mich. There are no seams in this large kitchen island. A lightweight GFRC mix was used instead of traditional wet-cast concrete mix to reduce the weight from 950 pounds to only 450 pounds. Both the island and perimeter countertops in the kitchen were integrally colored with a beige pigment selected from a Benjamin Moore paint color chart. The homeowners were sold on the ability of concrete to be custom colored to coordinate with their decor. 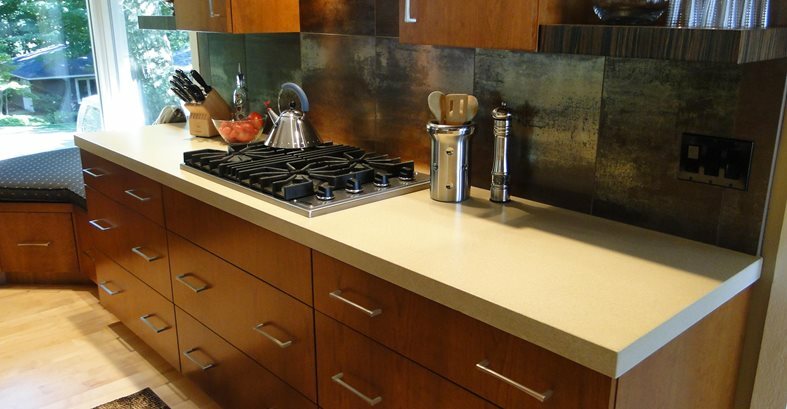 A close-up of one of the perimeter kitchen countertops, which features a built-in stovetop. 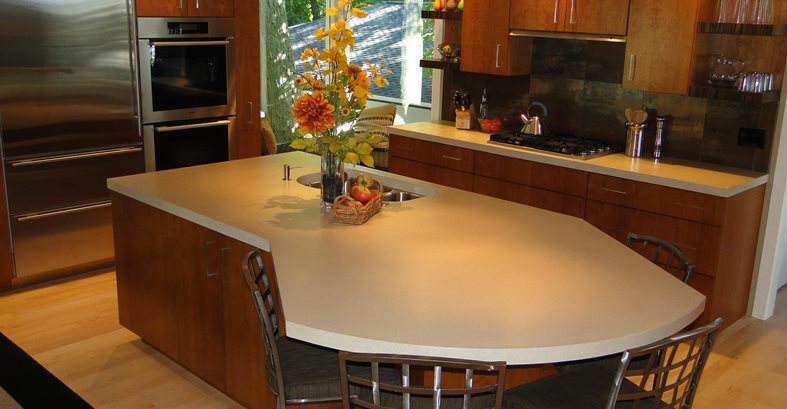 These homeowners had two demands for their kitchen countertops and island: They wanted a custom color and they wanted the island to be in one piece with no seams. Hard Topix Precast Concrete of Jenison, Mich., was contacted to tackle the project and assured them that by using concrete they could do both. "It's the customization factor that really draws our customers to select concrete countertops," says David Eerdmans of Hard Topix. The home, which sits on the shores of Lake Michigan, has a large set of stairs going up to the front door, which made access difficult. "We decided that in order to get the 34-square-foot island in the house in one piece, we would have to build it out of glass-fiber-reinforced concrete," says Eerdmans. The two perimeter countertop pieces were also done in GFRC, so they would match perfectly. The countertop color, Bleeker Beige, was replicated directly from a Benjamin Moore paint color chart. "Our customers are experimenting more with color and texture and love the fact that we can pour almost any color from the Benjamin Moore color chart. It really opens up some doors as far as matching countertops to the overall design of the room," says Eerdmans. After casting the countertop, Hard Topix gave it a light diamond-grind finish and then sealed it with a topical sealer cured by ultra-violet light to provide long-lasting protection from stains and scratching. 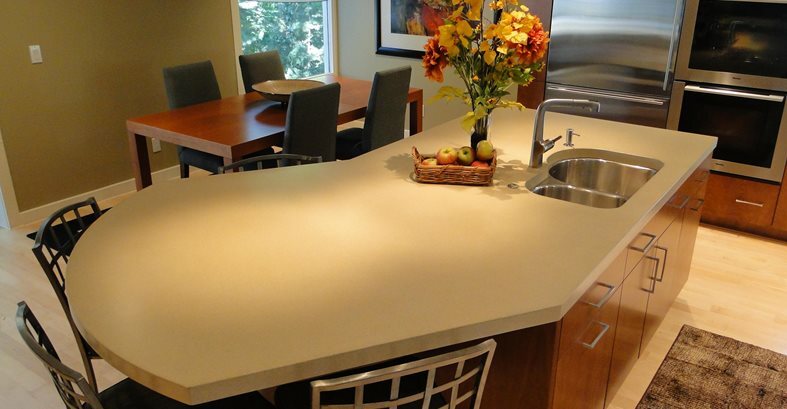 The GFRC countertop mix was designed by Eerdmans and Tom Fischer at Fishstone Concrete Countertop Supply, Elgin, Ill. The total weight of the island, which was poured in one piece, was approximately 450 pounds. The thickness was 2 inches, with a foam core to help reduce the weight. "If poured with our regular concrete mix, the island would have weighed 950 pounds," says Eerdmans. Even so, four men were needed to carry the piece up the flight of steps and into the house. "With a regular wet-mix concrete this would not have been possible," he says. Hard Topix Precast Concrete, Jenison, Mich.